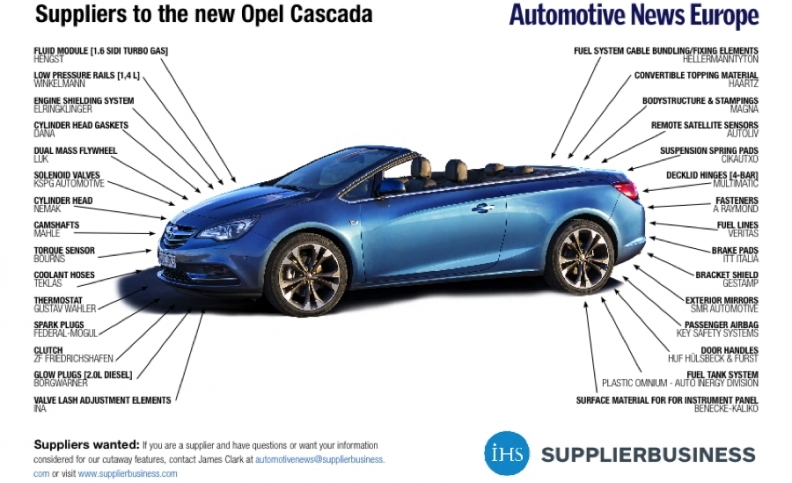 Magna International and Haartz Corp. teamed up to provide the new Opel Cascada’s convertible roof. Haartz supplies an acoustically enhanced three-ply composite made from an acrylic twill weave outer fabric, rubber inner layer and polyester lining fabric. The fabric offers enhanced sound deadening and insulation compared with conventional convertible roof materials, Haartz claims. Magna supplies the complete softtop to Opel, which builds the four-seat Cascada at its factory in Gliwice, Poland. The Cascada marks is a shift for Opel, which previously offered the four-seat Astra TwinTop and two-seat Tigra TwinTop with retractable hardtops. Magna also provides the Cascada’s inner door and side panels as well as its body structure and stampings. Body stiffness, which improves handling, was a key requirement when designing the Cascada and several measures were taken to ensure an optimal balance between torsional and bending stiffness, Magna said. The four-seat cabriolet has cross steel bars in the underbody and reinforced side sills. This helps reduce noise, vibration and harshness and improves the car body’s torsional stiffness by 41 percent and upgrades its bending stiffness by 27 percent compared with the Astra TwinTop. The first Cascada rolled off the Gliwice production line in February 2013.